Though the Dominican Republic’s capital and largest city is Santo Domingo, the country’s largest airport is actually Punta Cana International Airport, outside of Punta Cana. Travelers can get by on $30 per day, though a budget of $50 per day would be more comfortable. December to March and June though August are the high seasons for tourists. The Dominican Republic is tropical enough to maintain temperatures between 18 and 30˚C (65-85 ºF) throughout the year. Handmade crafts like statuettes and jewelry are often purchased as souvenirs in the DR. The Dominican Republic occupies just over half of the Caribbean island of Hispanolia, which it shares with Haiti. Most travelers visit the country for its gorgeous beaches, laid back attitude, and historical connections. The Dominican Republic was the first place Christopher Columbus set foot in 1492, and its capital Santa Domingo is the oldest city in the Americas. Today, the island relies heavily on tourism, and receives more travelers per year than any other Caribbean island. The island also contains the Caribbean’s largest lake, Lake Enriquillo, tallest mountain, Pico Duarte and several incredible national parks. Relatively little is known about the history of the Dominican Republic’s indigenous peoples. The Taíno people were a major influence on the early history of the nation, though they were largely driven out by the Carib peoples during the 15th century. As we’ve already mentioned, Columbus arrived in the Dominican Republic in 1492, when five Taíno chiefdoms existed. The Spanish brought with them foreign diseases, which decimated the Taíno population very quickly. In 1496, Christopher Columbus’ brother, Bartholomew Columbus, orchestrated the construction of Santo Domingo, the first European settlement in the Americas. The Spanish used Santo Domingo as the seat of their colonial empire. After decimating the Taíno peoples, the Spaniards imported African slaves to work in the Dominican Republic. Even today, the African heritage of the country is strongly felt. Ultimately, the Spanish were more attracted to South America, and France took control over the entire island. However, power of the Dominican half of the island soon shifted back to Spain just 7 years later. Today, this heritage is represented in the languages spoken in Hispaniola; the Dominican Republic speaks Spanish, while neighbouring Haiti speaks French. In 1821, the Dominican Republic officially earned its independence, though neighbouring Haiti almost immediately took over the nation. In 1838, the country again earned its independence, which it defended regularly against Haitian raids. However, it once again became a Spanish colony in 1861. For the next 50 years, the DR experienced numerous short-lived governments, assassinations, and independence movements and it was occupied briefly by the United States. Though the country experienced political instability throughout most of its history, since 2011 the nation has improved dramatically under the leadership Danilo Medina and his numerous social projects. The massive city of Santo Domingo was recently split into five separate districts, with Districto Nacional being the most interesting for tourists. This is where the Colonial Zone, Santo Domingo’s old city, is located; this area has been declared a UNESCO world heritage site. This area contains Ozama Fort, the Cathedral, and Alcazar de Colon, the first European fort, church, and prison in the Americas respectively. In contrast, the area of El Malecon is very modern, featuring great shopping, nightclubs, casinos, and restaurants. Plaza de la Cultura is also worth a visit, as it contains five museums and the national theatre. The region of Punta Cana is located on the eastern tip of the Dominican Republic and draws a huge percentage of the country’s tourists. 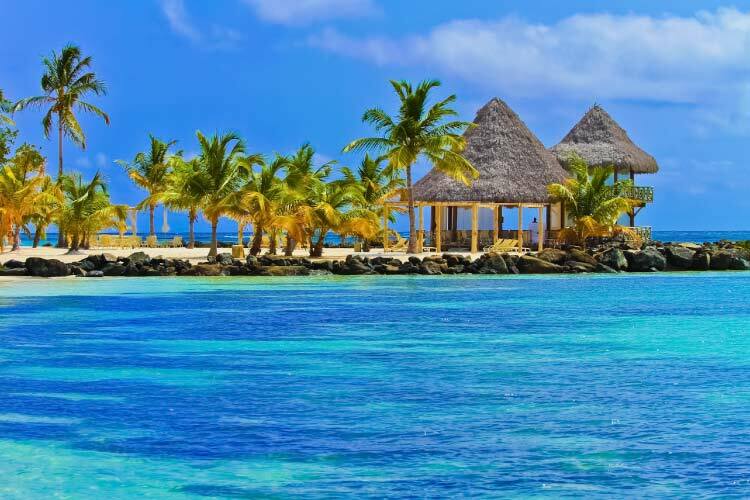 Punta Cana is where you’ll experience all the hallmarks of a traditional Caribbean vacation: gorgeous beaches, luxurious resorts, and high prices. Punta Cana can get extremely touristy, but its crystal clear waters and powdery white sands are definitely worth seeing. Bavaro Beach is a popular and gorgeous beach destination in Punto Cana. The region is also known as a prime locale for scuba diving. After Santo Domingo, Santiago de los Caballeros is the next most populated city in the DR. This charming city is constructed almost entirely in traditional Spanish architecture, especially in the neighbourhoods surrounding Centro Leon, the central square. This square features art galleries, museums, theatres, and a variety of dining options. Nearby Calle de Sol contains most of the best shopping outlets in the city and is a must-see while in Santiago. The large monument of El Monumento de Santiago sits on a tall hill outside of the city and is worth of exploring. Most of Santiago’s best nightlife destinations are also clustered around the monument. 1. 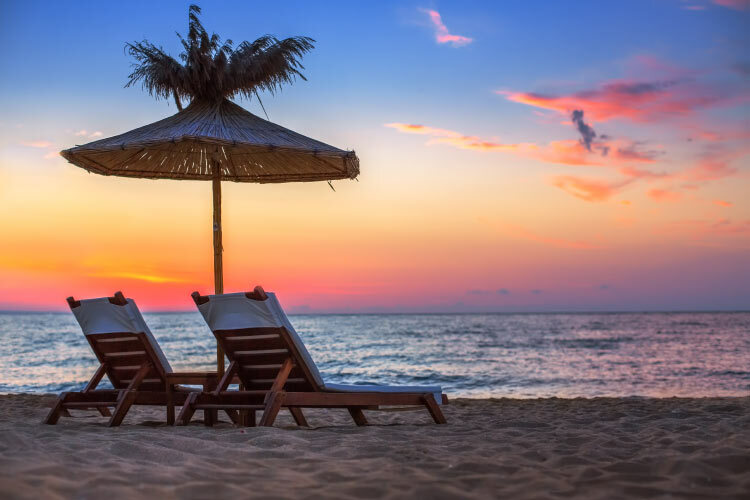 Spend some time relaxing on the famous beaches of Bavaro in Punta Cana, then head to one of the upscale lounges to interact with other tourists. Several shopping destinations exist in the areas surrounding the beach, with el Corctecito being the best area. Bavaro is also known for its upscale hotels, especially the Barcelo. These hotels are nice to explore, even if you don’t have the funds to actually stay there. 2. Just outside of the town of La Romana sits Altos de Chavón (pictured below), a village built in 1976 to resemble a 16th century coastal Mediterranean town. The town is famous for its arts scene, and even today is considered the cultural capital of the DR. Be sure to visit to Altos de Chavón amphitheater, which has seen performers ranging from Frank Sinatra to Elton John to Duran Duran. The Génesis nightclub is also quite popular among travelers. 3. 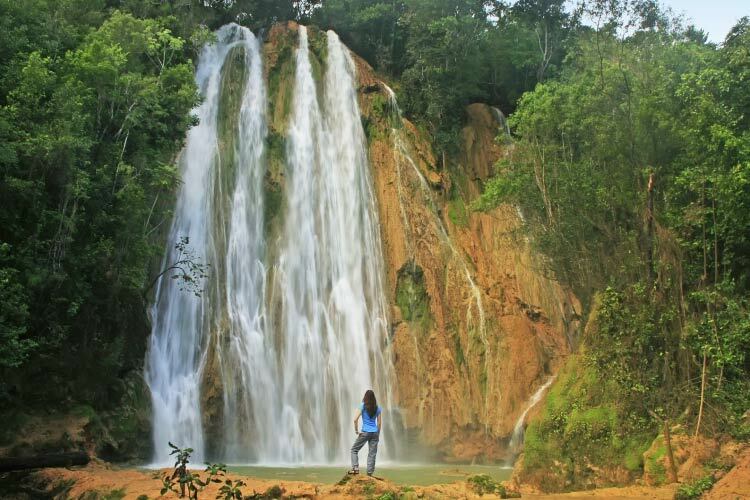 La Romana is also near El Este National Park. This massive national park is known mostly for its fabulous beaches, biodiversity, and archaeological history. The park contains the popular tourist destination Saona Island, which is well known as a high quality scuba diving location. The island also contains a turtle sanctuary that’s worth a visit. 4. 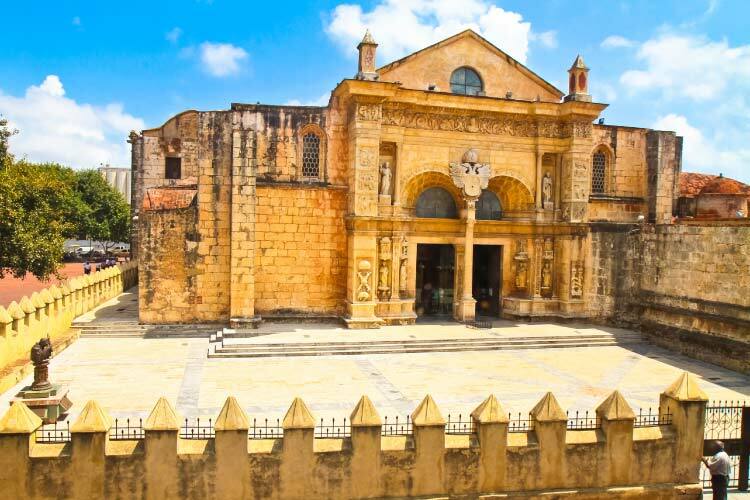 As the DR’s largest city, Santo Domingo has lots to offer travelers. Head to the Colonial Zone to check out the first European church, fort, and prison in the Americas, to name but a few firsts the town holds. 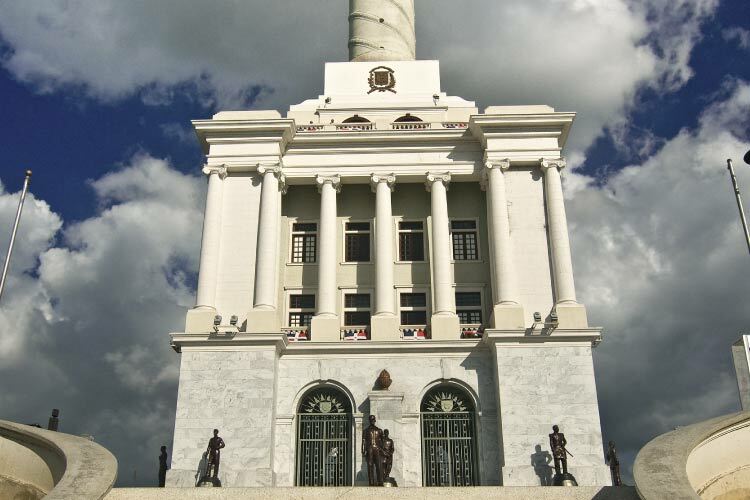 Contrast this with the Plaza de la Cultura, who’s five museums and rotating cultural exhibits highlight the best of modern Dominican culture. 5. Take a stroll through the streets of Santiago de los Cabelleros and marvel at the traditional Spanish architecture of the town. Then, head to Centro Leon, the city’s centre point. Several museums, nightclubs, and cafes surround Centro Leon. Be sure to check out El Monument de Santiago for the awesome view, and to visit the various nightlife destinations that surround the monument. 6. Though most people think of the Dominican Republic for its beaches, the nation also contains a lovely mountain range, fittingly titled the Central Mountain Range. José Armando Bermúdez National Park outside of Santiago is a great place to explore the mountain ecosystem. This park contains the tallest mountain on the island (and in all of the Caribbean), Pico Duarte. Climbing this mountain is a popular activity among travelers. 7. Puerto Plata is a lovely town on the Dominican Republic’s north coast. While there, the sights to see are a large replica of the Christ the Redeemer statue originally found in Rio de Janeiro and the ancient Fort San Felipe. The town also contains the Museo del Amber, a fascinating museum contains numerous amber samples of prehistoric species. Of course, Puerto Plata also has a number of gorgeous public and private beaches that are perfect for an afternoon of relaxation.